I got all the episodes on my comp, the FC model, the 86 model, the 86 starter deck and the FD starter deck. 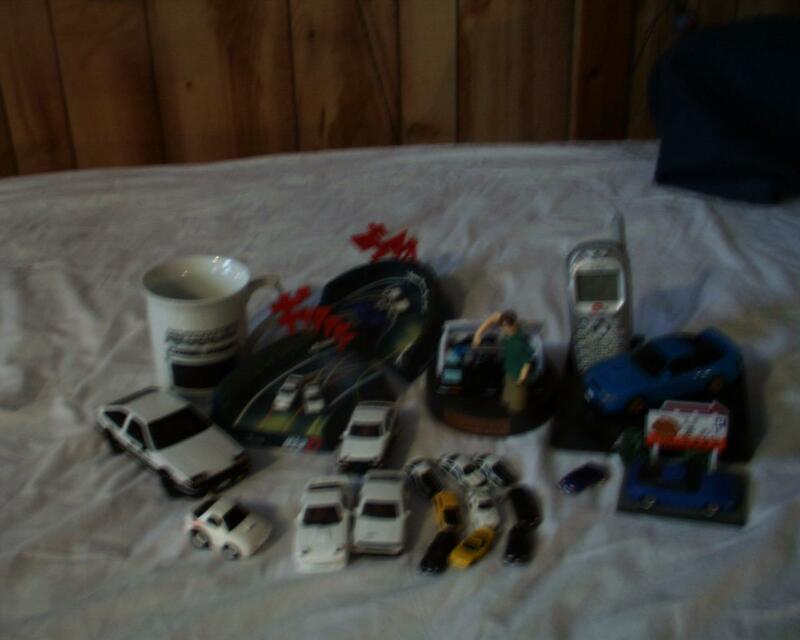 All together... only about $40 worth of initial d merchandise. Hi everyone, just thought i'd jazz things up in the Merchandise Section by bringing back this old thread and creating it into an Official Initial D Personal Collections Thread! Feel free to list your personal collections and upload pictures of them as well. Also feel free to keep editing your lists if and when they change, or feel free to add new posting discussing and showing off any new merchandise you have purchased. I have cleaned out all unecessary posts within this thread so that the main posts that remain here are those listing members' collections. I will continue to monitor this thread and clean it out on a timely basis if necessary; however, feel free to engage in light discussion. It would only be absolute off-topic and un-needed posts that will be cleaned out. * Post your shrine!, (pic request) Whats in your collection? I have 1st, 2nd and 3rd stage on dvd. The Import PS2 game, Initial D: Special Stage. And a bunch of ID MP3s on my Hard drive. that's REALLY sad, lol. I have the first manga, and soon to have 1st stage. On my computer i have an Initial D desktop im making that's in the process(need 1 more pic to edit and put in but i cant find it) and a few ID songs. I got all the episodes, a little manga, an FC body for my kyosho mini-z and uh that's about it. I have 1st, 2nd, 3rd, extra and battle stages, wall scroll, Jap PS2 with Special Stage, Initial D memory card. Oh and a wallet! Almost all of the episodes(can't find some 2nd stage in japanese) on my computer, and some stuff I ordered from House of Anime that I should be getting in a week or so. EDIT: Just bought an Initial D Zip Zap set and the House of Anime stuff will be in on monday. And The box set from jack a deal on the way, but i just started to get into this stuff more will come. Initial D Special Stage and all the episodes on the Computer. lol not much i guess. i might get the collectors box set of the cars though. The one with nakazato, keisuke, ryousuke, takumi, and wataru i think. Ok, a few weeks ago I ordered some Initial D stuff from "ToysN Joys". I just recived the box today, just to find out that their was only one thing I ordered in it. And that ONE thing was defective. That place said that the other stuff was out of stock, and they didn't even tell me that in the first place. I have to send that one thing back. My Zip Zap messed up, took that to Radio Shack, they gave me a new car, and that seems to be defective also. Here is a picture of my current collection. Complete DVD set Japanese & TokyoChop 1-3 DVD, 8 soundtrack CDs, bit Char-G Project D Set(AE86 & FD), TokyoChop manga 1-10, 2 Card game starter sets, Zip-zaps FC-FD-AE86-AE85, HPI Micro Rs4 w/ AE86 body, keychain, japanese manga vol26-27(I can't read Japanese...Heh), ps2 import special stage, PC game ID:Mountain Vengance, red 1984 Toyota SR5..........I think that's about it. I got it at this website. i have vids, a crapload of mangas, jap and chinese along with my bro tokyocrap and i have the redsuns T-Shirt, i wear it torepresent the rotaries...i have one. my bro likes to show it off to his friends.